CT NOFA’s Farm and Food Guide is Available! 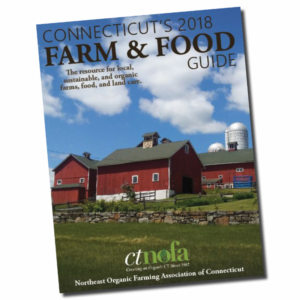 CT NOFA is pleased to announce the availability of the brand new Connecticut Farm & Food Guide 2018 – their signature publication & online guide to finding all the organic things near you. WANT A COPY? Join CT NOFA and get the new Farm & Food Guide mailed to you right away. Plus, as a BONUS* for new and renewing members, receive NOFA’s Intro to Organic Lawns & Yards by Sarah Little, Ph.D. This comprehensive booklet will get you on your way to organic soil management and landscaping. (*While supplies last; offer valid until June 1, 2018). So toss your fresh copy of Connecticut Farm & Food Guide 2018 in your bag or car for the next time you are out-and-about in Connecticut. Or use it to plan your next weekend adventure through the countryside. If you misplace it, no problem. The 2018 Guide is always online for quick reference at www.ctnofa.org.